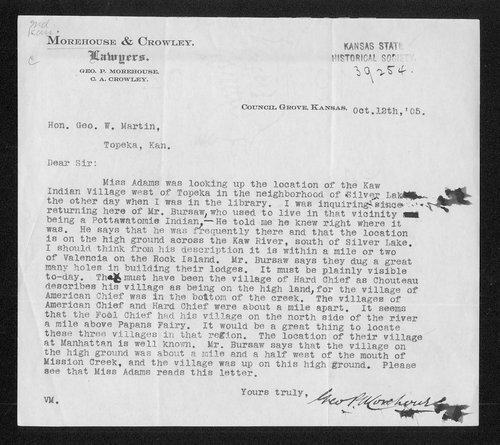 In this brief letter to George W. Martin of the Kansas State Historical Society, lawyer George Pierson Morehouse of Council Grove, Kansas, describes the location of the Kaw Indian village located near Silver Lake, Kansas. According to Morehouse, Jon Bursaw explained to him that the Kaws "dug a great many holes in building their lodges." Morehouse then speculates that the village must be the same one mentioned by one of the Chouteau brothers, as the village of Kaw leader "Hard Chief" because of its location above the Kaw River.